I've made three forms of Rocky Road in the past couple of months, and thought that I should post about them today, what with it being Bonfire Night and all that. Rocky Road just feels bonfire-y to me - I'm not sure if it is a Bonfire Night thing or not, but anyway, here we are. The first was for my best friend's partners birthday back in September, who is a big fan of Rocky Road. I decided to make a cupcake version and after a bit of research went with this recipe from Baking Mad. Unfortunately, it was a disaster! I don't know if I was just a bit out of 'the zone' as I hadn't baking in over a month and had just come back from holiday, but the first batch just wouldn't seem to cook and by the time I was satisfied they were cooked, they were actually completely burnt. ARGH! So I reverted to my bog standard usual chocolate cupcake recipe and used the topping from the recipe and they worked a treat! Sadly that's where the pictures dry up since I didn't get any photographic evidence of the other Rocky Roads, so I will have to ramble my way through the rest of the post! The second batch was Actual Rocky Road - or not, depending on how strict you are with your criteria. 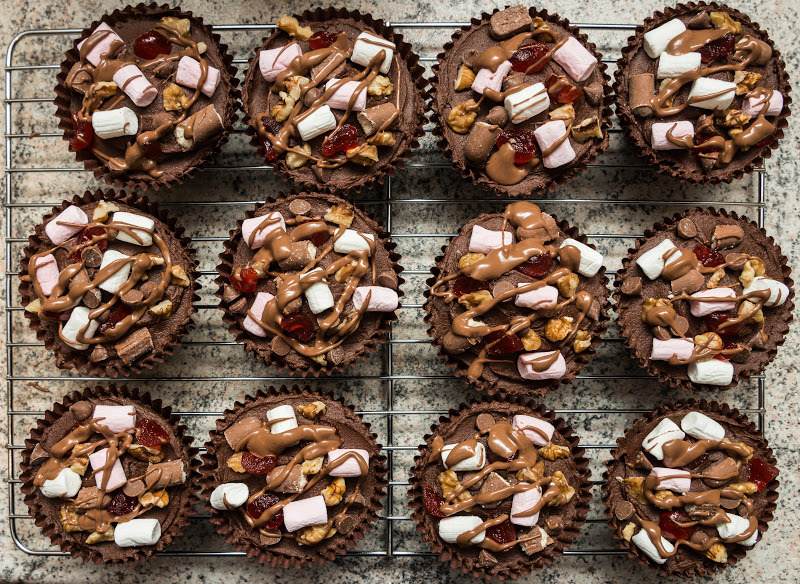 Mike was going on a rally day with some friends in the deepest darkest forests of Wales so I thought Rocky Road would be a good snack for a group of hungry petrol heads, plus it would be easier to cart about than anything cakey and dainty. I melted up 500g of Dairy Milk and mixed in some chopped up Chocolate Fingers and some mini marshmallows - not sure how much, just enough so that it wasn't too runny. Poured into a lined square 20cm baking tin, chilled until set, and cut into squares. I know that any Rocky Road purists will be horrified that there was no nuts or cherries but we prefer our Rocky Road to be as sugary and sweet as possible! 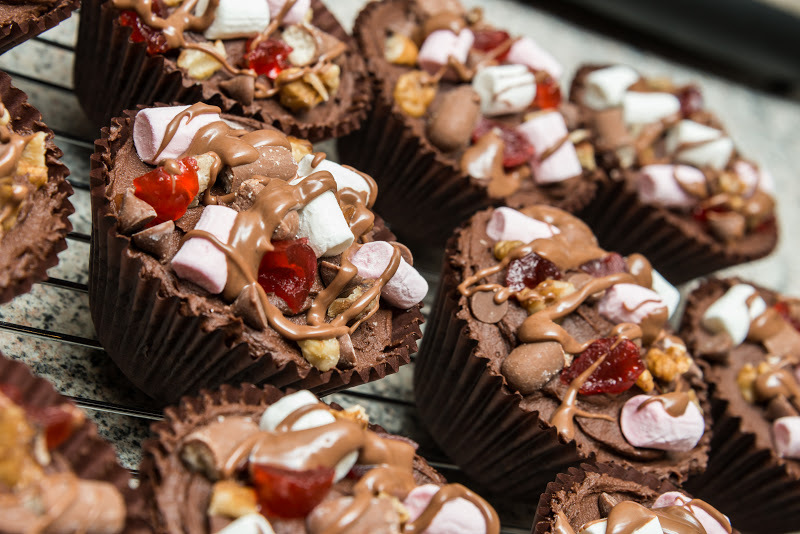 The third lot was a batch of Rocky Road cupcakes for Mike's sisters Bonfire Birthday Bash last Friday night. Similar to the first lot, I used my usual chocolate cupcake recipe, topped with the fudgy icing from this recipe, stuck on some chopped up Chocolate Fingers and mini marshmallows and drizzled some Dairy Milk over the top. Again no nuts or cherries but the birthday girl hates her cakes being infiltrated by anything nutty or fruity! After all that, I don't think I want to even think about Rocky Road again for at least another year! These look so good. I think it's the marshmallows that make them feel bonfirey. I've never added chocolate fingers to rocky road so I'll definitely keep that in mind the next time I make them. 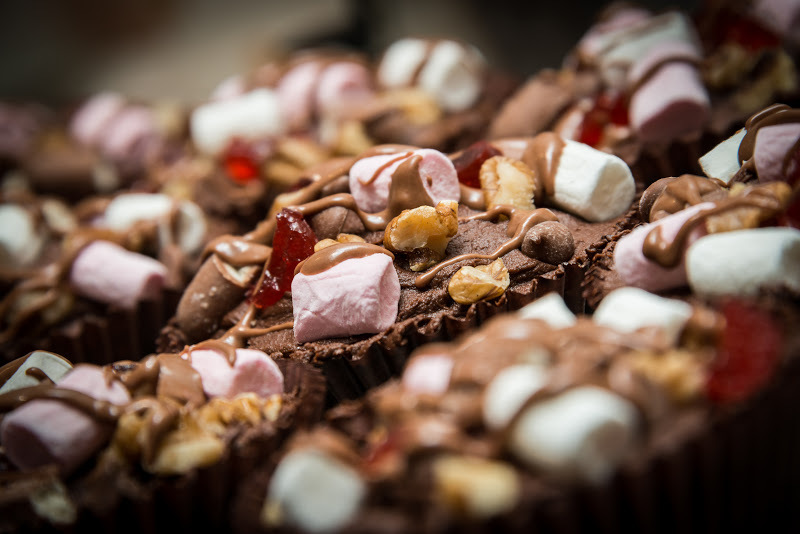 I love rocky road in any form, and especially in cupcakes! Yours look great!